Twitter is a great place to network, and you can meet many fab companies and suppliers on there. One of the things I’d like to achieve with the LLLM blog is find all my readers the best of the best in the wedding industry. Via Twitter I have offered my ‘services’ to review products for companies, and then publish my findings on here. 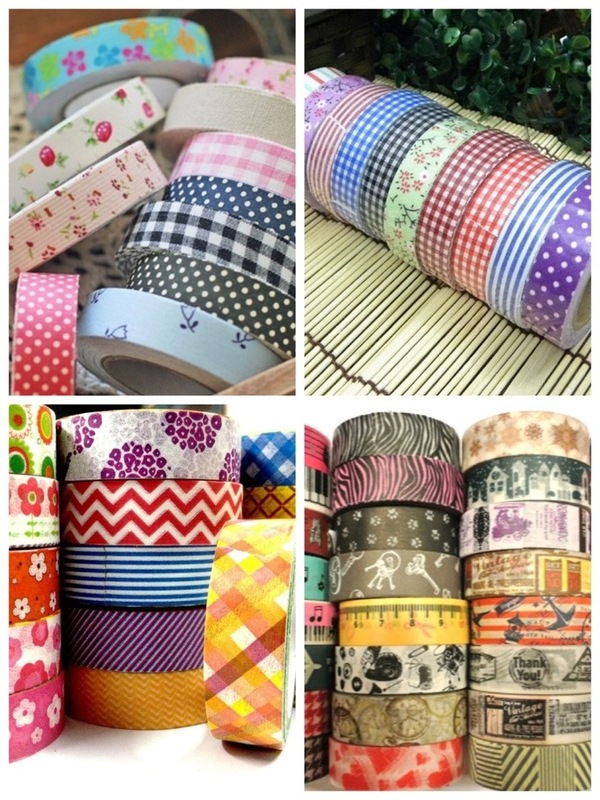 If you’ve never heard of ‘washi tape’ then you NEED to get online and look it up! Its basically glorified sellotape BUT its so much better than the average see-through stuff – its SUPER pretty and there’s guaranteed to be something to match your colour scheme. I used washi tape on my envelopes to pretty-fy them and help seal the envelope flap. Seeeeeeee! So. Pretty! And whats even better is that prices start from only £1 a roll!! And I only used one and a half rolls to decorate over 100 wedding invitations! Even though we only sent our wedding invitations out last Thursday (so 6 days ago), we’ve already received 7 RSVP cards back! Those 7 cards equate to knowing that 14 out of 81 of the people we invited to share in our wedding ceremony, and 1 out of the 65 people we’ve invited to our evening reception will be coming! 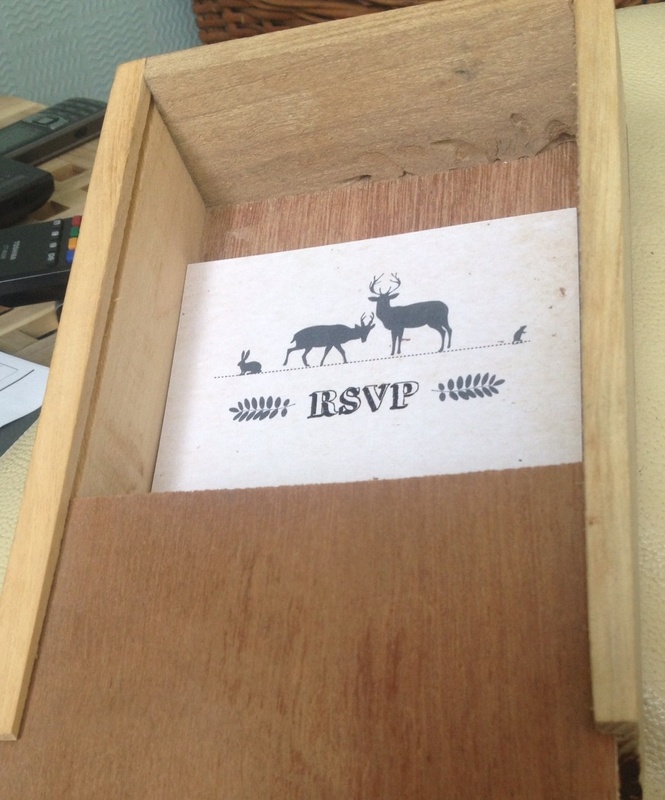 I’m storing all our RSVP cards in a little slide-top wooden box that was found with my late-Grandmother’s possessions. The RSVP cards fit perfectly in there and it keeps them safe incase I need to refer back to them at anytime. Hopefully we should receive more of our RSVP cards in the coming weeks – fingers crossed everyone can make it! Our invitations are probably my most favourite thing in our wedding. They are amazing. I love them. The fabulous and talented Hannah Hubbleday at Love Doodle was the genius creator of our invitations. I gave her a rather un-weddingy idea to work with; my favourite childhood book and TV programmes, The Animals of Farthing Wood but what she has created is amazing. My fiancé and I met at a nature reserve and so we wanted to tie that into our wedding somehow seeing as it wasn’t actually possible for us to get married there! And what Hannah created merged our love of the outdoors with wedding elegance. 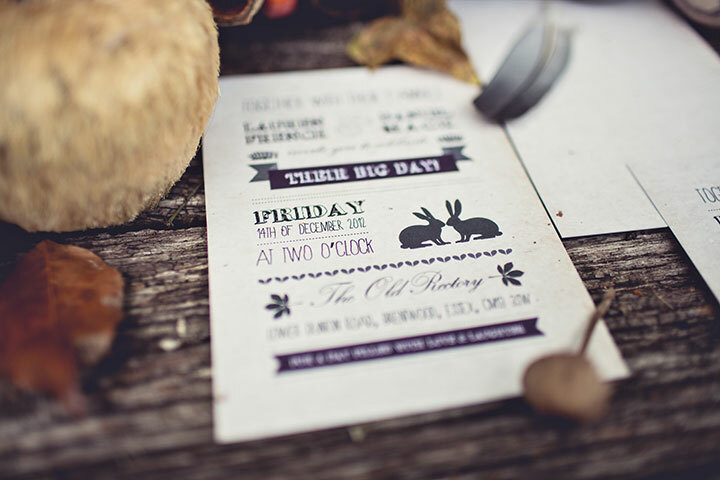 I can’t tell you how much I’d recommend Hannah at Love Doodle; she put so much effort into creating the perfect stationery for us and even though we only sent our invitations out on Thursday, I’ve already had compliments from those who have received them!! Please check out her website so you can see the amazing range of stationery she has already created, plus realise the scope for you to design something new with her. On Thursday afternoon we posted our wedding invitations!! Its such an important and exciting step…there’s no going back now!! We ARE getting married!! Sending out wedding milestones is a massive milestone and tells the rest of the world that its all going ahead! Our guests will be receiving them in the next few days and hopefully they’ll send back their RSVP cards with their acceptances or regrets in the coming weeks! 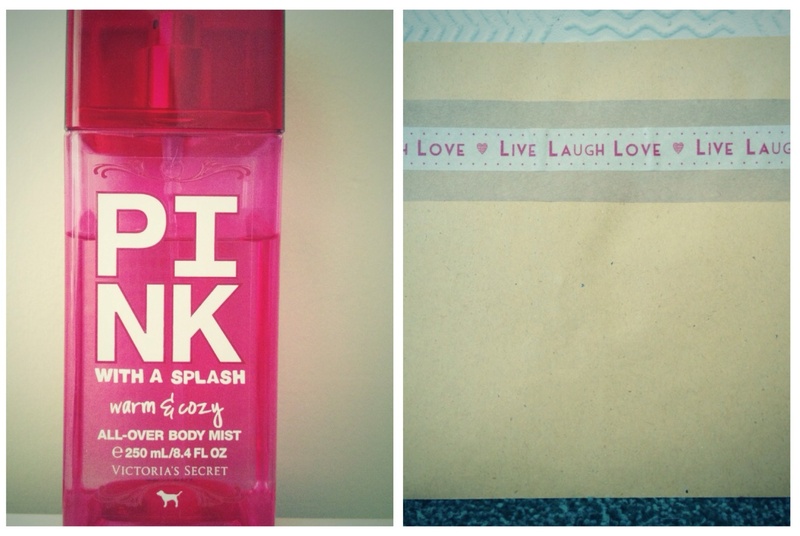 I also took an idea from Elle Woods in Legally Blonde… I spritzed our invitations with some Victoria’s Secret perfume! It’s a bit of a funny thing to do but hopefully they’ll smell nice as they travel through the postal system! Borderline bridezilla?! Cant wait to hear from our guests to see who gets theirs first! !